The title lists a few synonyms for the word lies. Many readers might consider that word a little too harsh or caustic, so I’ll minimize its use throughout the rest of this post. As many of you are aware, I’ve been publishing blog posts about the natural warming of global sea surface temperatures for 4 years and about the natural warming of ocean heat content for more than 3 years. Untruths about those findings are commonplace in comments at blogs run and visited by proponents of manmade global warming, and sometimes those bloggers are foolish enough to state those falsehoods when they visit my blog. There are two untruths about my findings that stand out—at least for me. They’re the whoppers, the big fibs. The second untruth is the time periods I used in my discussions of the natural warming of the global oceans are cherry picked. I’ve also included another topic in this post, because it might be linked to the first untruth. It’s a discussion of how the naturally created warm water released by the El Niño then warms surface temperatures globally. 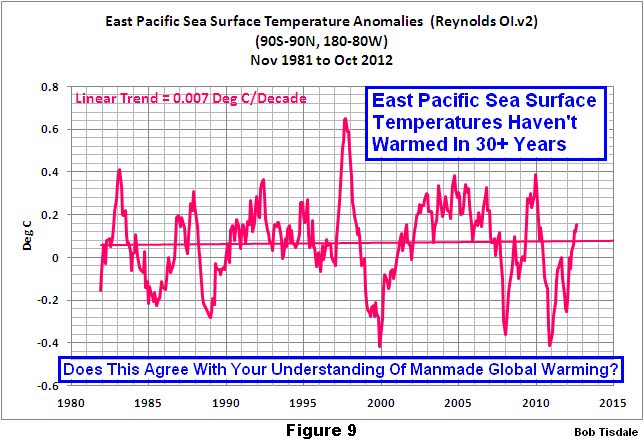 And for much of the world, the warming occurs without a direct exchange of heat from the tropical Pacific. This fact seems to elude many proponents of manmade global warming—who appear to have the misunderstanding that the warm water and heat released by an El Niño somehow directly warm, with exchanges of heat, areas that are physically remote to the tropical Pacific, like the North Atlantic. Many of you have been following my posts about the natural warming of the global oceans for the past 4 years. There’s really nothing new discussed in this post. In the following, I’ve reworded descriptions and added a few illustrations from my book. So you’re probably wondering why I’m writing another rehashing. 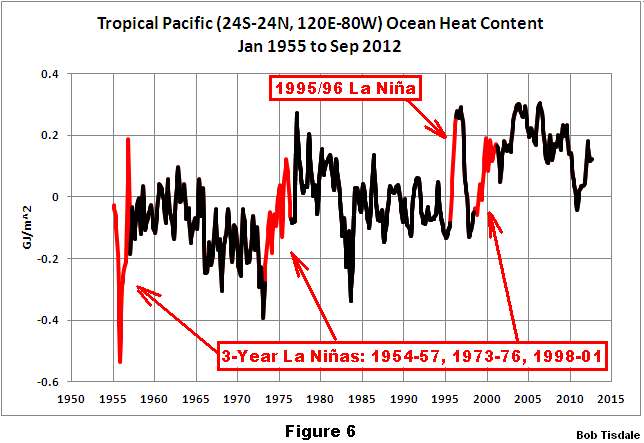 – How ENSO is responsible for the warming of tropical ocean heat content since 1955. And I’ve written it as a reference. I’m tired of responding time and again to the same old fabrications. With this post, I can use the word-search feature of my blog to find this post, searching for the word “lies”; and I can then either provide a link to this post or cut and paste the replies I’ve written here. And of course other skeptical bloggers can do the same when they run into these untruths around the blogosphere. There’s one last reason for this post. I wanted to have it as a reference so that I can link to it from a document I will be releasing very soon. Many global warming skeptics will enjoy that document; proponents of manmade global warming—well—not so much. The fuel for El Niño events is provided by the warm surface and subsurface waters of the tropical Pacific. The ultimate source of the energy to create that warm water is the sun. 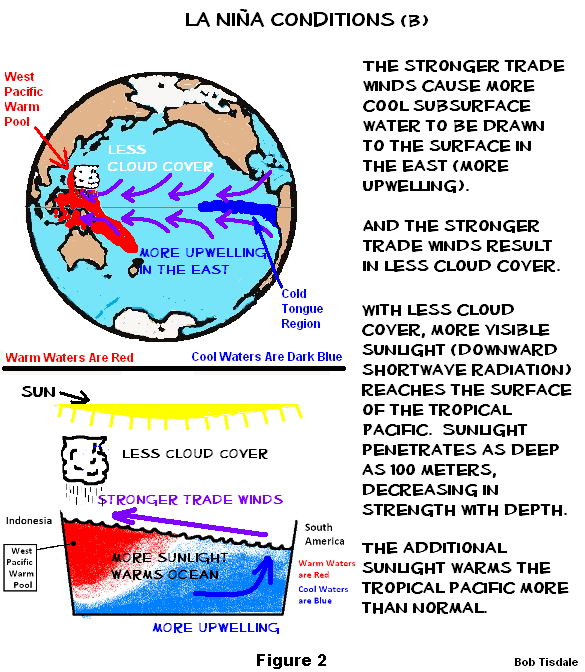 The sun’s ability to warm the tropical Pacific Ocean to depth is impacted by cloud cover, which is varied by the sea surface temperature gradient and the strength of the trade winds in the tropical Pacific. There’s more cloud cover over the tropical Pacific during an El Niño because the El Niño is releasing heat from the ocean to the atmosphere through evaporation, and, conversely, there’s less cloud cover during a La Niña—more on the La Niña impact on cloud cover in a moment. 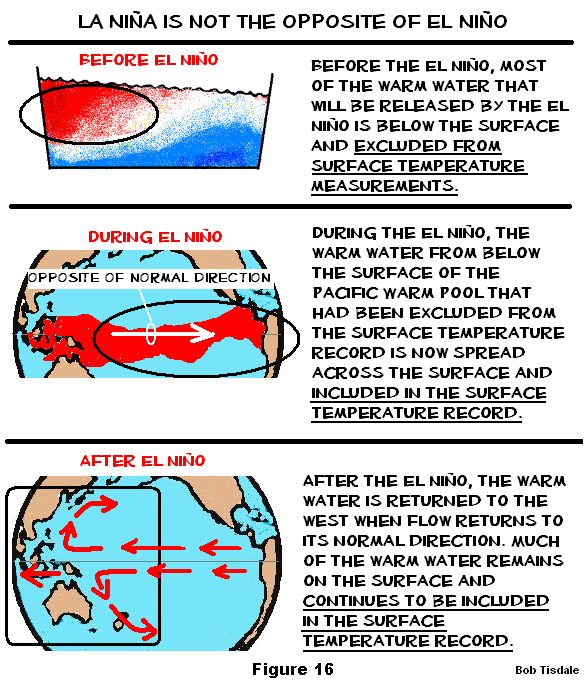 During general discussions, I typically write something to the effect of: La Niña events also recharge part of the warm water that was released during the El Niño. They accomplish this through an increase in downward shortwave radiation (visible sunlight), which results from the reduction in tropical Pacific cloud amount caused by the stronger trade winds of a La Niña. How does a La Niña reduce cloud cover? 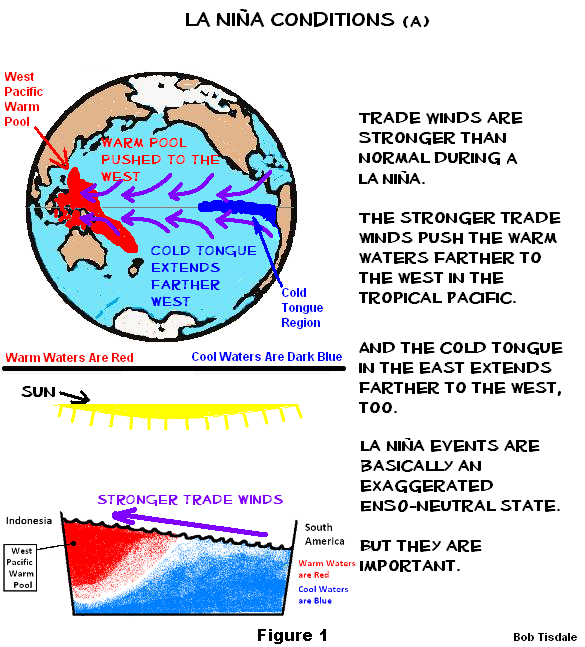 Trade winds are stronger than normal during a La Niña. The stronger trade winds draw more cool water than normal from below the surface of the central and eastern tropical Pacific, in a process called upwelling. As a result, there is less convection, cloud cover and precipitation there. The stronger trade winds also push the cloud cover farther to the west. With less cloud cover over the tropical Pacific, more sunlight can reach into the ocean there and warm it to depth. I began discussing and presenting that relationship (in more detail and in easier-to-understand terms) in blog posts starting more than 3 years ago. So for those who claim I never discussed the heat source that drives El Niño events, the history at my blog contradicts you. Many of those posts, including the samples that follow, were also cross posted at WattsUpWithThat, which is the world’s most-visited blog about global warming and climate change. The blog history at WUWT also contradicts the misinformation spread by proponents of manmade global warming. For examples of my past blog posts that include those discussions, refer to the ones dated November 26, 2009 here, February 13, 2010 here, August 8, 2010 here, and July 26, 2011 here. In my blog posts and in my book Who Turned on the Heat?, I’ve provided Pavlakis et al (2008) ENSO Surface Shortwave Radiation Forcing over the Tropical Pacific as a reference for the interrelationship between cloud amount and downward shortwave radiation (visible sunlight from the sun). Refer to my Figure 4, which is Figure 6 from Pavlakis et al (2008). 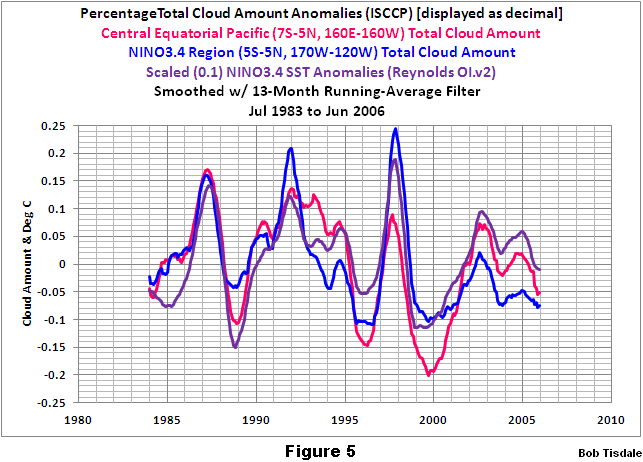 In graphs such as Figure 5, I’ve illustrated the relationship between ENSO-related sea surface temperature variations and cloud amount in parts of the equatorial Pacific referred to by Pavlakis et al (2008). Because the ocean heat content of the tropical Pacific fuels El Niño events, I’ve presented the response of the ocean heat content of the tropical Pacific to ENSO, which shows it warmed primarily in response to the La Niña events of 1954-57, 1973-76, 1995/96 and 1998-2001. See Figure 6. The stronger trade winds associated with La Niñas yield less cloud cover, which allows more sunlight to warm the tropical Pacific to depth. Not too surprisingly, the only times the ocean heat content for the tropical Pacific shows any significant warming were during the 3-year La Niña events of 1954-57, 1973-76, and 1998-01 and during the freakish 1995/96 La Niña. In looking at the Ocean Heat Content data for the tropical Pacific, it’s very obvious that the fuel (the warm water) for the 1997/98 El Niño was created during the 1995/96 La Niña. The 1997/98 El Niño released and redistributed that warm water, which in turn, caused the sea surface temperatures to warm about 0.19 deg C in an apparent step in the Atlantic, Indian and West Pacific Oceans (which cover about 67% of the surface area of the globe), Figure 7. 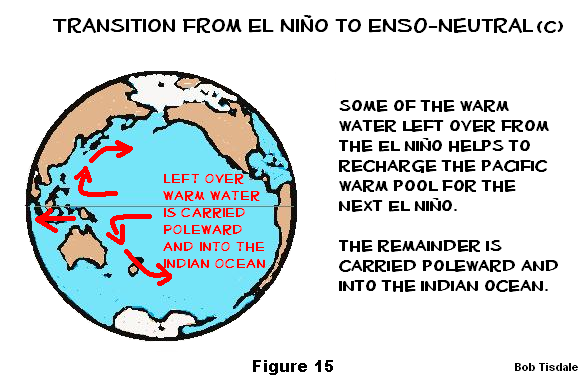 Recently, I’ve also illustrated how the warming of the Atlantic, Indian and West Pacific oceans from pole to pole (90S-90N, 80W-180) is dependent on the 1986/87/88 El Niño, 1997/98 El Niño, and 2009/10 El Niño. 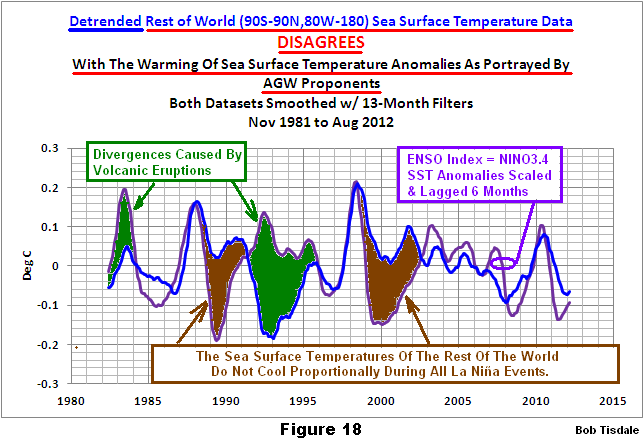 That is, as shown in Figure 8, without those El Niño events, the sea surface temperature data for the Atlantic, Indian and West Pacific oceans would not have warmed since 1984. (The eruption of El Chichon in Mexico counteracted the effects of the 1982/83 El Niño. That’s why we exclude it from that timeframe.) Let’s look at it another way: that period since January 1984 contains 348 months. The Atlantic, Indian and West Pacific oceans only warmed during 40 of those months, or less than 12% of the time, and the El Niño events are the causes of the warming when warming occurred. Or, in other words, Atlantic, Indian and West Pacific oceans show no evidence of warming for more than 88% of the time since January 1984. And of course, the sea surface temperatures of the East Pacific from pole to pole, Figure 9 (which covers the other 33% of the surface of the global oceans), have not warmed in 31 years. One untruth down, one to go. Cherry-picking is one of the favorite complaints by proponents of manmade global warming about data presentations. When they don’t like someone’s, anyone’s, presentation of surface temperatures, for example, they fall back on their tedious mantra of cherry-picking. 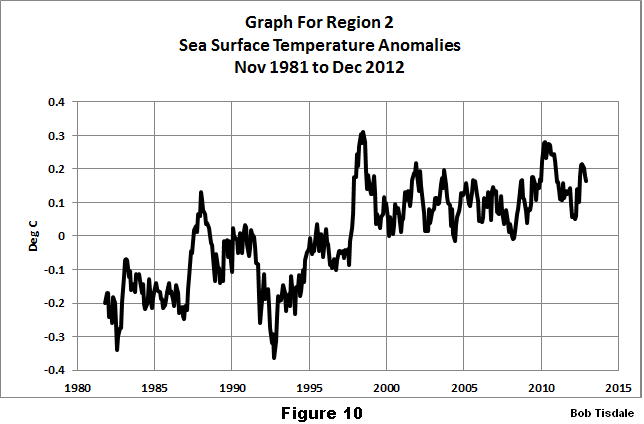 Figure 10 is a graph of the satellite-era sea surface temperatures of the Atlantic, Indian and West Pacific Oceans (90S-90N, 80W-180). 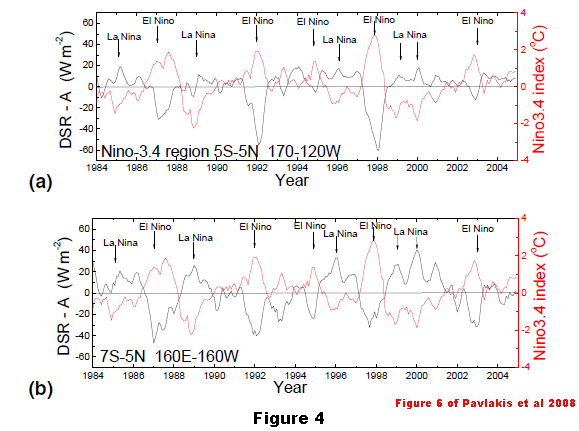 It’s the same data shown in Figure 7, but in it the El Niño events haven’t been highlighted. Take a good look at it. Anyone familiar with the instrument temperature record would be happy to tell you that the short-term rises in temperature are likely to be the responses to major El Niño events. The response to the 1997/98 El Niño stands out—same thing for the 1986/87/88 El Niño. The 1982/83 El Niño was counteracted by the volcanic aerosols spewed from El Chichon in 1982, and the dip and rebound starting about 1991 was caused by the explosive volcanic eruption of Mount Pinatubo that year. At the tail end is a tiny upward shift that would be the response to the 2009/10 El Niño. Again, anyone familiar with the instrument temperature record could provide a similar explanation. 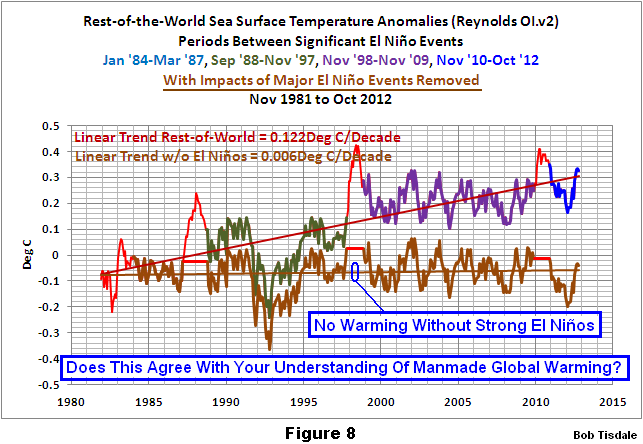 When I see a comment that says I’ve cherry-picked the start and end months of time periods of those El Niño events (highlighted in red in Figure 7), the first thing I want to ask is if they have any understanding of the instrument temperature record, because their comment suggests they have no clue—none whatsoever. The lag of six months was established by comparing the scaled ENSO index to the sea surface temperatures for the Atlantic, Indian and West Pacific Oceans. 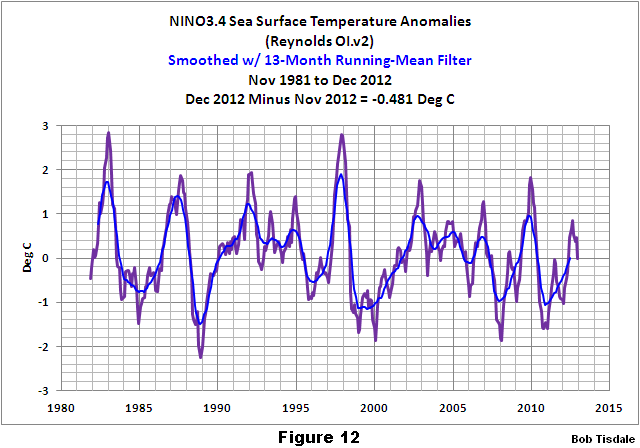 The ENSO index data (NINO3.4 sea surface temperature anomalies) were shifted in time until the leading edges of the responses of both datasets to the 1997/98 El Niño aligned. Refer to Figure 11 for an example. 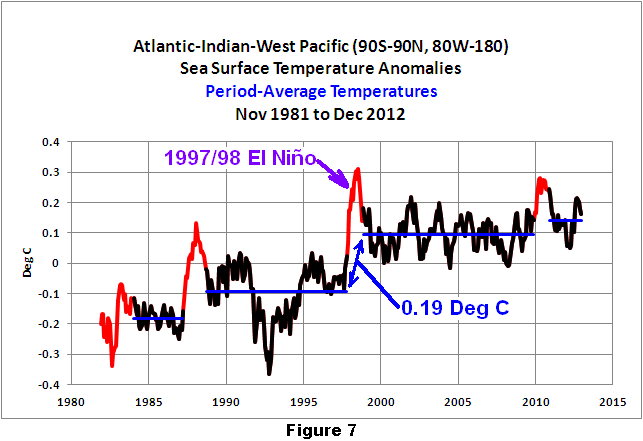 Why focus on the 1997/98 El Niño? It was the strongest El Niño during this time period and was strong enough to overcome the weather noise that can and does appear in the responses of the Atlantic, Indian and West Pacific data to the lesser El Niño events. Why focus on the leading edges? We use the leading edges because there are obvious persistent aftereffects that skew the response of the data for the Atlantic, Indian and West Pacific Oceans. I did not want to be accused of cherry-picking start and end dates of the periods before, between, and after the upward shifts. For the graph of the ocean heat content of the tropical Pacific, Figure 6, I used the ONI dataset again to identify the “official” months of the 3-year La Niña events of 1954-57, 1973-76 and 1998-2001 and for the months of the 1995/96 La Niña. They were not lagged because the La Niña events have a direct impact on the ocean heat content of the tropical Pacific. Again, no cherry picking involved. We’ve already discussed when, and the extent to which, the sea surface temperatures for the Atlantic, Indian and West Pacific Oceans warm in response to strong El Niño events. And we’ve discussed how, why and when the ocean heat content for the tropical Pacific warms in response to the 3-year La Niñas and to the unusual 1995/96 La Niña. So far the processes of ENSO provide natural explanations for that warming. 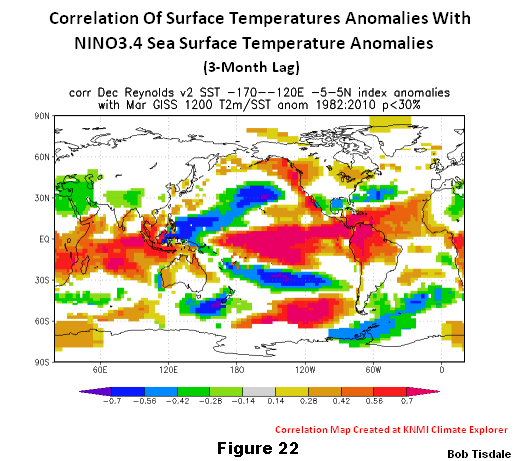 But we have not discussed in this post how the processes associated with strong El Niño events warm the sea surface temperatures of the Atlantic, Indian and West Pacific Oceans in those apparent shifts. First: A strong El Niño event releases a huge volume of naturally created warm water from the surface and below the surface of the western tropical Pacific, an area called the west Pacific Warm Pool. That warm water is carried east—sometimes as far as the coasts of the Americas—with some of it spreading across the surface of the central and eastern tropical Pacific. Much of the warm water can remain below the surface of the eastern equatorial Pacific during the El Niño. The sea surface temperatures of an area of the eastern equatorial Pacific called the NINO3.4 region are often used to determine how often El Niño and La Niña events occur, how strong they were, and how long they lasted. In other words, they serve as an ENSO index. See Figure 12. It may be easier for many of you to think of La Niña and El Niño events as a recharge-discharge oscillator—with La Niña as the recharge phase and El Niño as the discharge phase. We monitor the sea surface temperatures of the NINO3.4 region to tell us that discharges (El Niños) and recharges (La Niñas) are taking place. 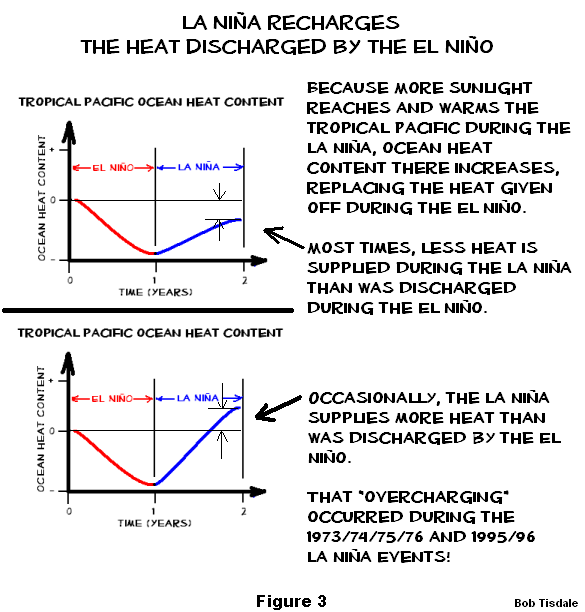 But an ENSO index only tells us that the discharges and recharges are occurring and their relative strengths and durations; it does not tell us how much warm water has been created during the La Niña (recharge) phase, and it does not tell us how much warm water has been released and redistributed by the El Niño (discharge) phase. We’ve already discussed the recharge phase, so let’s spend a little time on the discharge phase. As a further expansion on what was written above: the sea surface temperature anomalies of the NINO3.4 region do not tell us how much warm water was released by the El Niño from below the surface of the west Pacific Warm Pool, and it does not account for all of that warm water after the El Niño—warm water that has then been redistributed within the nearby ocean basins during the La Niña that trails the El Niño. It also does not account for the areas around the planet that warm without an exchange of heat from the tropical Pacific—that’s how and why much of the planet warms in response to an El Niño event, with no exchange of heat. That’s been presented and discussed in scientific papers for decades. Let’s start with what happens to the warm water after the El Niño. I’m going to borrow a few cartoon-like illustrations with text from my ebook Who Turned on the Heat? Refer to Figures 13, 14 and 15. Refer also to Figures 16 and 17, which also note one of the differences between El Niños and the La Niñas that trail them. For 4 years, I’ve presented an animation that clearly shows the very strong Rossby wave (discussed in Figure 14) after the 1997/98 El Niño and how it returns a huge volume of leftover warm water from the eastern to the western tropical Pacific. Click here for a gif edition that begins at the peak of the 1997/98 El Nino. (It’s from the animation tpglobal.mpeg that used to be available from the JPL. I’ve uploaded the full version of that animation to YouTube here.) Then watch what happens after the leftover warm water reaches Indonesia. There’s a secondary El Niño-like event taking place in the western tropical Pacific, and it’s happening while the La Niña is occurring in the central and eastern tropical Pacific. I first presented an edited version of that animation in my post from 4 years ago titled Can El Nino Events Explain All of the Global Warming Since 1976? – Part 1. And here’s a link to Part 2. That secondary El Niño-like event in the western tropical Pacific counteracts the effects of the La Niña event in the central and eastern equatorial Pacific. That’s why the sea surface temperatures of the Atlantic, Indian and West Pacific oceans do not cool proportionally during the La Niña events that follow the 1986/87/88 and the 1997/98 El Niños. We can show that’s true by detrending the Atlantic, Indian and West Pacific data and comparing it to a scaled ENSO index. This has already been presented in the post as Figure 18. Note how the detrended Atlantic, Indian and West Pacific data (identified as the “Rest-of-the-World” as opposed to the East Pacific) does not cool fully during the 1988/89 and 1998-2001 La Niñas. 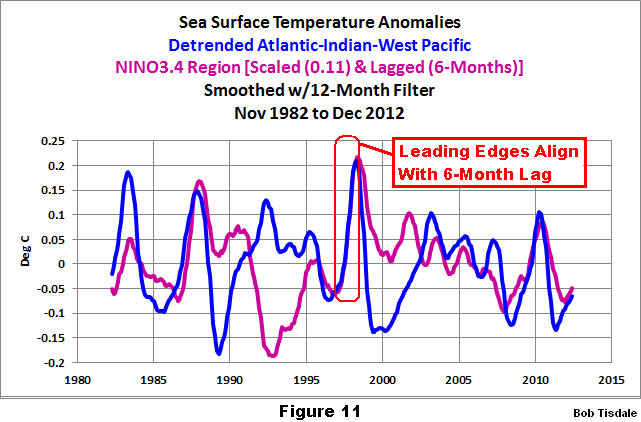 Because the Atlantic, Indian and West Pacific data does not cool proportionally during those La Niña events, the sea surface temperatures there appear to shift upwards in El Niño-induced steps, see Figure 7, and in basic terms, that’s what they are—upward shifts caused by the discharges of huge volumes of naturally created warm water. You can actually watch an upward shift occur in another animation, here. This animation first identifies the area I initially used to illustrate the upward shifts. That area was the East Indian and West Pacific Oceans (60S-65N, 80E-180). The graph to the right fills in as the animation progresses. It presents the sea surface temperature anomalies for the East Indian and West Pacific oceans and the scaled data for the NINO3.4 region, our ENSO index. 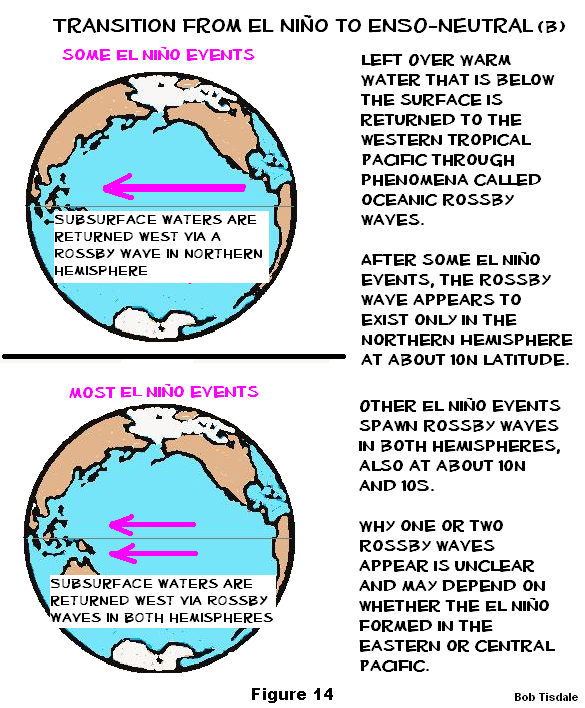 Some of the shift occurs in response to the warm water returned via the Rossby wave, and some of the shift occurs because warm surface water that’s left over from the El Niño is also swept back to the West Pacific and East Indian oceans when the trade winds resume in the tropical Pacific. We still have to discuss how an El Niño warms areas remote to the tropical Pacific—those regions that are not directly impacted by the warm waters released by the El Niño and redistributed in its wake. Once again, I’ll borrow a couple of illustrations from my book Who Turned on the Heat? See Figures 19, 20 and 21. 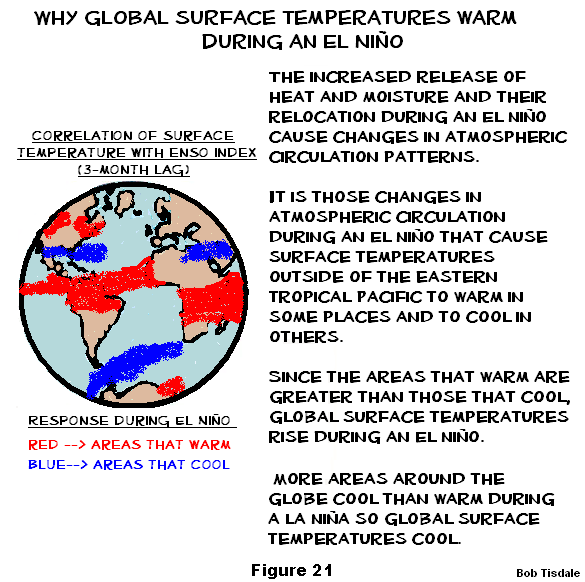 In Figure 21, the red and blue colored portions of the globe depict areas that warm and cool in response to an El Niño event. The illustration may appear a little awkward, but the following correlation map was used as a reference, Figure 22. 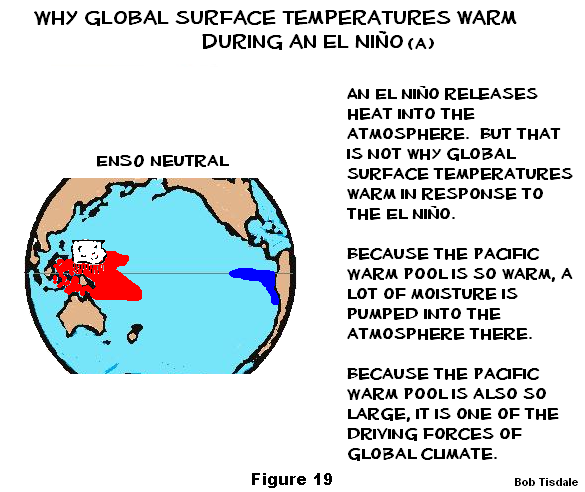 I noted above in Figure 21 that an El Niño causes changes in normal atmospheric circulation patterns. It’s those changes in atmospheric circulation, not a direct exchange of heat, that cause temperatures to warm or cool around the globe (remote to the tropical Pacific) in response to an El Niño—with the warming exceeding the cooling—and as a result, global surface temperatures warm in response to the El Nino. The changes in atmospheric circulation are associated with shifts in the normal locations of the jet streams in both hemispheres, which impact where surface temperatures warm or cool in response to an El Niño. NOAA provides reasonably easy-to-understand explanations of how and why that occurs at webpages linked to their The ENSO Cycle webpage. First refer to their discussion of the “normal” state of atmospheric circulation linked to Mean wintertime jet streams over the North Pacific and South Pacific. Then there’s their webpage for the El Niño-related changes in atmospheric circulation in the subtropics and middle latitudes. And of course there’s the flip side of the coin for La Niña La Niña-related changes in atmospheric circulation in the subtropics. I attempted in my book Who Turned on the Heat? to make those discussions from NOAA more understandable for non-technical persons. 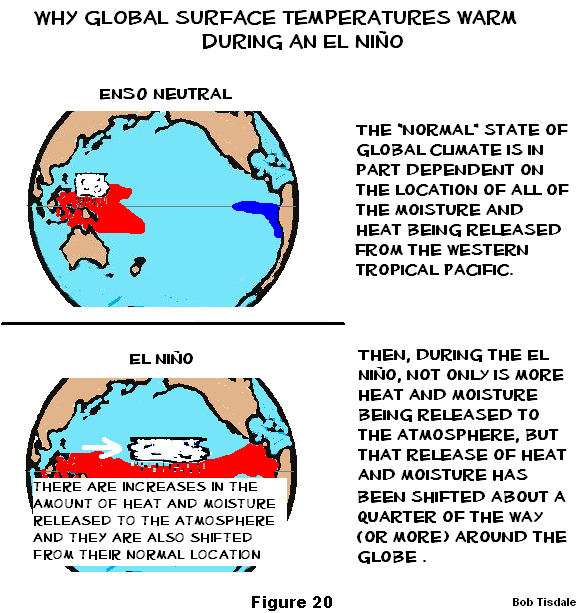 Trenberth et al (2002) Evolution of El Nino–Southern Oscillation and global atmospheric surface temperatures explain in minute detail how areas around the globe warm in response to an El Niño without a direct exchange of heat. Those two oceans might be separated by the land mass of Central America, but the atmosphere above them is not. We already know how and why the trade winds weaken in the eastern tropical Pacific during an El Niño. Those changes in atmospheric circulation in the Pacific, in turn, cause the trade winds in the tropical North Atlantic to weaken, too. The slower trade winds blowing across the surface of the tropical North Atlantic Ocean don’t cool the surface waters as much as they normally would; there’s less evaporation with the slower trade winds; so the sea surface temperatures warm in the tropical North Atlantic. That’s only part of the explanation. With trade winds in the North Atlantic at their normal strength, cool waters from below the surface are pulled up to the surface there. 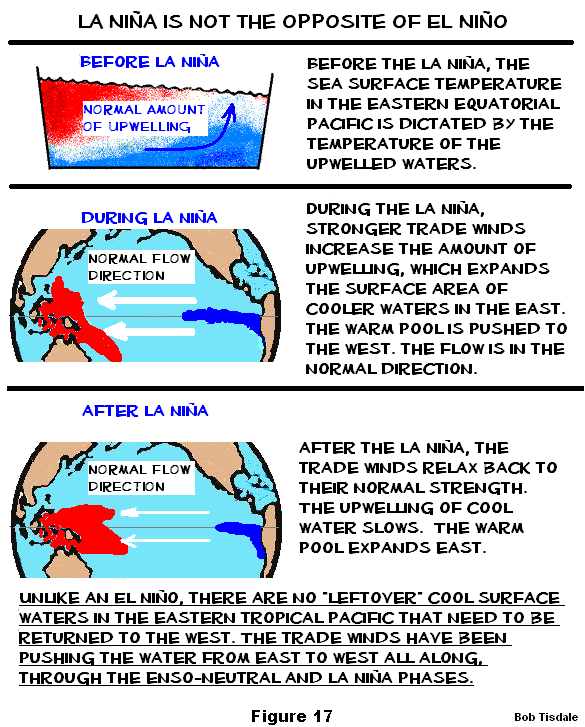 In other words, where upwelling occurs, it is occurring at its normal rates when the trade winds are at their normal strengths. 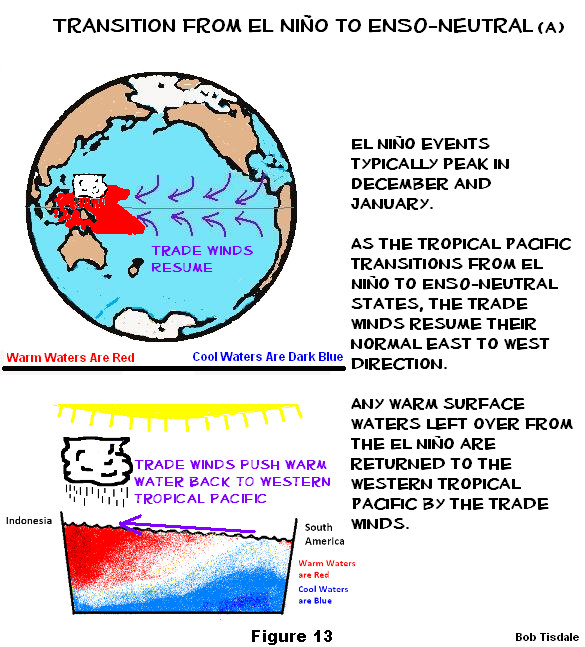 When the trade winds weaken during an El Niño, there is less cool water being pulled up to the surface, so the tropical North Atlantic warms as a result of that weakening process also. Refer to Wang (2005) ENSO, Atlantic Climate Variability, And The Walker And Hadley Circulation for a more detailed discussion. It’s all logical. Everything fits with a world in which the global oceans warm naturally. During a multidecadal period when El Niño events dominate (a period when El Niño events are stronger, when they occur more often and when they last longer than La Niña events), more heat than normal is released from the tropical Pacific and more warm water than normal is transported by ocean currents toward the poles—with that warm water releasing heat to the atmosphere along the way. As a result, global sea surface and land surface temperatures warm during multidecadal periods when El Niño events dominate. They have to. There’s no way they cannot warm. Conversely, global temperatures cool during multidecadal periods when La Niña events are stronger, last longer and occur more often than El Niño events. That makes sense too because the tropical Pacific is releasing less heat and redistributing less warm water than normal then. Oh please. Your Figure 5 is just more cherry-picking of short-term (and arbitrary) trend lengths that fit your agenda. None of it would pass peer review (have you ever tried?). When I stopped laughing, I replied at January 19, 2013 at 6:42 am. To date, you have NEVER provided a source of heat that keeps driving up SSTs and the overall global temperatures, on any of your responses, be they here, at SkS, or elsewhere. As you’ll note, much of my January 19, 2013 at 7:51 pm was included in this post. Now for the icing on the cake: another blogger then took a portion of my reply and posted it in a January 22, 2013 at 9:47 pm comment elsewhere. Typically I write something to the effect of: La Niña events also recharge part of the warm water that was released during the El Niño. They accomplish this through an increase in downward shortwave radiation (visible light), and that results from the reduction in tropical Pacific cloud amount caused by the stronger trade winds of a La Niña. Was that beyond you, Harry? No explanation given by B. Tisdale as to why the “Pacific cloud amount caused by the stronger trade winds of a La Niña” is any greater (or lessor) at this time than it has been at any other. Obviously, the author of the comment failed to read beyond what he quoted, including the linked posts, or was using misdirection, or simply could not understand the remainder of my reply. He definitely failed to grasp the significance of the 1954-57, 1973-76, 1995/96 and 1998-01 La Niñas on the Ocean Heat Content for the tropical Pacific, facsimiles of which were presented in the first two posts linked to my comment from which he quoted. Refer to Figure 6, above, for an example. I’ve searched sea surface temperature records and ocean heat content data for more than 4 years (more than 3 years for the ocean heat content data), and I can find no evidence of an anthropogenic greenhouse gas signal. That is, the warming of the global oceans has been caused by Mother Nature, not anthropogenic greenhouse gases. The fundamental assumption of the greenhouse effect is that back radiation has warmed the surface from 255K to 288K. But this assumption is itself based on a false assumption. Roy Spencer (in his post about Greenhouse misunderstandings) claims in his point (6) that the atmosphere would have been isothermal at 255K in the absence of any GHG. In isothermal conditions there would be more potential energy (PE) in eash molecule at the top, and, because kinetic energy (KE) is homogeneous, molecules could “fall” downwards and do work in the process. hence it was not an equilibrium state, let alone one of maximum entropy, as is required by the Second Law of Thermodynamics. The Second Law of Thermodynamics has to be obeyed. So (PE+KE) has to be homogeneous, because otherwise work could be done, and so the system would not be at an equilibrium with greatest entropy, as the Second Law requires. In the process of reaching such equilibrium it is inevitable that molecules at the bottom have more kinetic energy, and there are more of them in any given volume, and so that does give a measure of higher pressure, yes. But the whole column could still cool down, maintaining the same gradient and pressure. So pressure does not maintain temperature. The relationship in the ideal gas law only applies in adiabatic conditions, but the atmosphere can radiate heat away. If you “turned off” the Sun, Venus atmosphere and surface would eventually cool down. We need to consider how the thermal energy actually gets into the Venus surface, especially at the poles. The facts are ..
(1) the poles receive less than 1W/m^2 of direct insolation. (2) the atmosphere 1Km above the poles is at least 9 degrees cooler, and not absorbing much insolation either. It could have at most 1W/m^2 coming back out of the surface, which (at 0.5 absorptivity) would raise it to a mere 7K. (3) Rather than being 7K, the lowest Km of the Venus atmosphere is around 720K, just a few degrees less hot than the surface. If all convection (resulting from absorbed incident insolation at various altitudes) only went down the thermal gradient (ie towards space) how would enough energy get into the surface, especially if it were even just 1 degree hotter than the base of the atmosphere? My answer is that the sloping playing field (the thermal profile) becomes a level playing field due to gravity, so all energy absorbed in the atmosphere (mostly incident insolation) spreads out in all directions, creating convection both up and down, and also diffusion and convection right around the globe producing equal temperatures at equal altitudes, but higher temperatures at lower altitudes. Then intra-atmospheric radiation reduces the magnitude of the net gradient by about 10% to 15% on Venus, (as best I can work out) but by about a third on Earth. Some of the extra reduction on Earth. though, is probably due to release of latent heat. Here’s a thought experiment. Construct a perfectly insulated sealed cylinder filled with pure nitrogen gas. Suppose there are two insulating dividers which you can now slide into place one third and two thirds up the cylinder, thus making three equal zones. Warm the middle zone with a heating element, which you then turn off. Allow equilibrium to establish with the warmer nitrogen in the central zone. Then remove the dividers. Those molecules which move to the top zone will lose some KE as they gain extra PE, whereas those which fall to the lowest zone will gain KE as they lose PE. Hence, when the new equilibrium is established, the highest zone measures a lower temperature than the middle zone, and the lowest zone measures a higher temperature than the middle zone. Hence the highest zone measures a lower temperature than the lowest zone. QED. So there is no need for any greenhouse effect to raise the surface temperature, simply because gravity cannot help but do so, because the atmosphere must obey the Second Law of Thermodynamics. Keep it up Bob. They can only go on pretending for so long and your output is simple data. Facts and the truth will always out. Thanks, ColdOldMan. Please let me know if you find more. Add to the list: Deceptions, Dupery, Indirection, Manipulation,Trickery, and Telling Porkies. I fixed the address of your link. gymnosperm: Looks like a lot of speculation–that is, the author provides no data to support what’s been stated. The full paper is behind a paywall. I got a copy, the science is generally beyond me but I get the gist. In essence it seems to say that a comparison of warming and breaking down the various components of ocean/air heat flux suggests it’s reduced heat loss from the ocean (they speculate this may be due to greater stratification) rather than increased heating that is resulting in increasing SST. Obviously coming from a completely different angle from you. Back to your work here it’s been baffling me why people can’t see that dynamical changes to oceans and atmosphere can change the overall heat content of different parts of the system or even the system as a whole. And that these processes can resolve itself on sub-decadal, multidecadal and even centennial timescales. Mosher sem to be fond of saying that ENSO can’t “create energy”, in one fell swoop completely missing the point. Also I suspect that your explanation of the process is still to simplistic given that there are such huge holes is our knowledge. Hoping that a succession of La Nina over the coming decades will shed further light on the subject for everybody. Anyone who makes such an erroneous statement has never looked at a graph of Ocean Heat Content for the tropical Pacific. I find this peculiar. If Qas is still positive (going into the ocean) yet getting smaller because of enhanced negative (heat loss) fluxes like the latent/sensible, as a response to the rising SSTs, why wouldn’t heat still accumulate, only at a slower pace? LIES is fine by me Bob. It’s accurate and precise. Use it by all means.